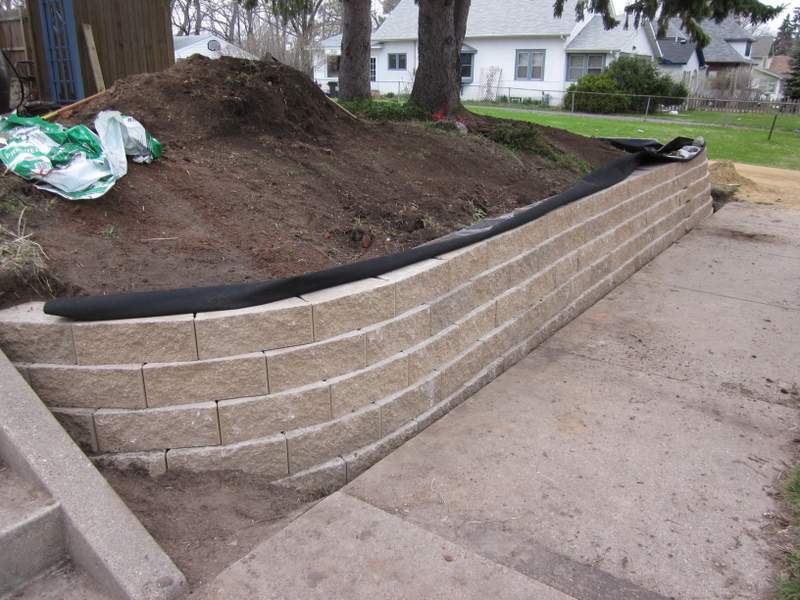 Last week I wrote about starting to build a retaining wall. Building up the rest of the wall with concrete blocks was easy. The concrete blocks we used have a lip at the bottom on the back side. This lip catches onto the layer below stopping the blocks from sliding forward. This type of wall is most stable if it is back filled. Back filling creates pressure from behind the wall, pushing the blocks forward, and engages each layer with the one below. These blocks are like the ones we used. Normally, you should put gravel right behind the wall for drainage, and then fill in the rest with soil that was dug out of the trench. But in our case, we didn’t need to use gravel for drainage, because our wall is under three feet high. Back filling the wall should be done in stages after each layer has been put in place. Use the soil that you dug out of the trench, minus grass and weeds. Removing plant material, not only prevents any weeds from reappearing, it also helps prevent subsidence when the plant material decomposes. Put a piece of good landscape fabric behind the wall. The landscape fabric will prevent soil from pushing through cracks between the blocks, but allow water to escape between the blocks. Use staples to hold the bottom of the landscape fabric in place. A few layers of blocks in place. Compact the soil using your feet, a tamper, or anything else that comes to hand and seems appropriate. Don’t get carried away, remember to leave enough room for the lips of the next row of blocks. The main part of the wall is finished. Notice the landscape fabric behind the wall. When you’ve finished the piling up the blocks, you can do what we did and lay the fabric back over the soil and cover with mulch. Alternatively, the landscape fabric can be trapped under the final layer of blocks and the capstone. It wasn’t until the following year that we decided on what to use as a capstone. That decision was rather made for us, but more about that in a future post. 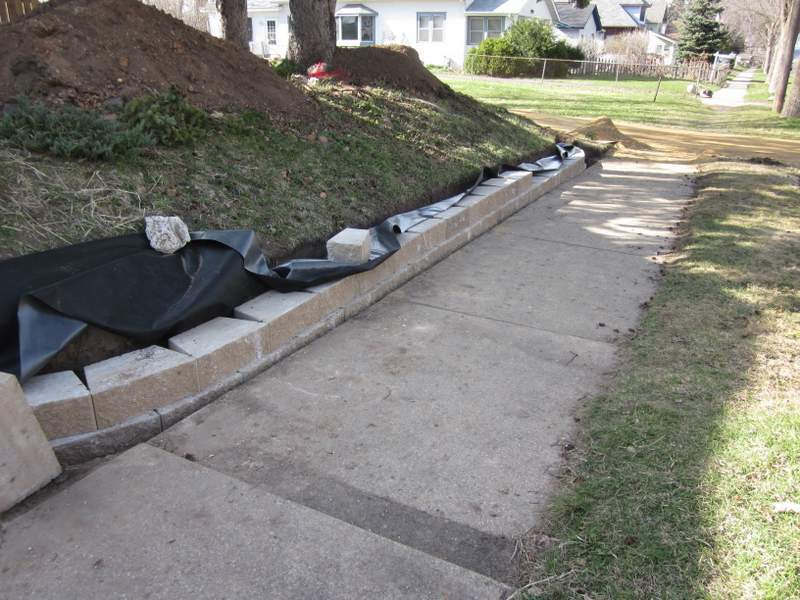 This entry was posted in Outdoor Building Projects, Walls & Floors, Yard & Garden and tagged retaining wall. Bookmark the permalink.